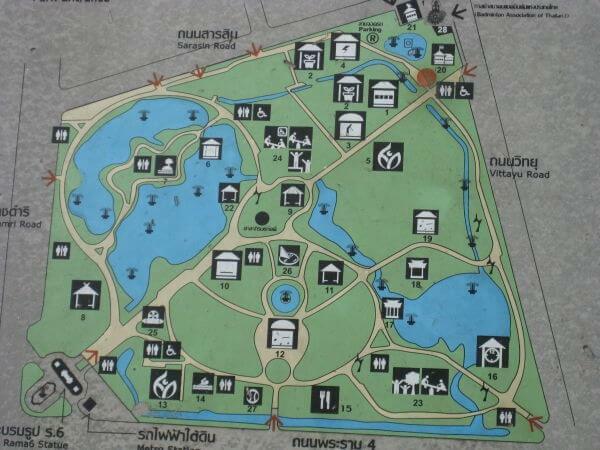 Lumphini Park (also Lumpini or Lumpinee, Thai: สวนลุมพินี) is a multi-purpose park. Many activities are provided for citizens and tourists. The park is a green area. There are a lot of trees, beautiful flowers, large lakes, and various type of animals. This park offers rare open public space, trees and playgrounds in the Thai capital and contains an artificial lake where visitors can rent a variety of boats. Paths around the park totalling approximately 2.5 km in length are a popular area for evening joggers. Officially, cycling is only permitted during the day between the times of 10am to 3pm. There is a smoking ban throughout the park, and dogs are not allowed. Lumphini Park was created in the 1920s by King Rama VI on royal property. This place was a museum, where many products and natural resources were shown, then after World War 1, it was rebuilt into the first park in Bangkok. A statue of the king stands at the southwestern entrance to the park. It was named after Lumbini, the birthplace of the Buddha in Nepal, and at the time of its creation stood on the outskirts of the city. Opening hours: Daily: 4:30 to 21:00 pm daily. 300 mtrs from BTS (skytrain) station Sala Daeng [street view] either exist to the busy street or use the sky walk. Pat Pong markets is night bazaar, not cheap but convenient, complimented with lots of bars and eats as well as the naughty places (red light) late into the night.